I've just come up for air from a prolonged excursion to the Texas-Mexico border with my family. It was hot, dusty, and windy (yes, 60+ mph winds only a couple of days ago). I also witnessed a couple of things I had never experienced before, such as a Mexican illegal hiding in my parents' property, en route to Houston, and even bobcats. Several nights ago, I was out on the deck, and noticed a strange, infernal glow coming from the southwestern sky. A brush fire. It looked as if the horizon was aflame. I also spent a long afternoon in Laredo, Texas. The last time I was there was back in 1986, when we crossed the border to take my grandfather to see a dentist in Nuevo Laredo. 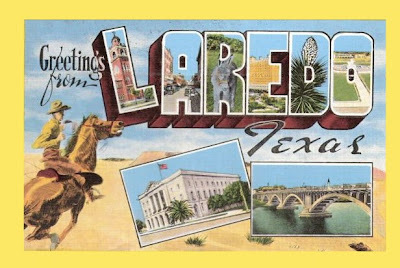 This goes without saying, but Laredo's transformation has been equally alarming and stunning. Now known as a locus of Cormac McCarthy-esque vioence, Laredo is one of the United States' most important ports of entry. Taking these two aspects into consideration -- it's bordertown woes and infrastructural significance -- one wonders why writers on urbanism and infrastructure have neglected this very important city along the Rio Grande River. [T]he port of Laredo is ranked first among ports along the Southwest border and fourth among all U.S. land ports for the value of goods that are shipped through the area. In 2004, $130.8 billion worth of goods and merchandise passed through the port of Laredo, an increase of 13 percent over the previous year. Over 40 percent of northsouth traffic that crosses our international border with Mexico drives across one of the international bridges in Laredo. Laredo’s primary industry is transportation and warehousing. In 2003, these industries contributed 16.2 percent of the total earnings of the area. Crossing the Rio Grande River into Nuevo Laredo, one finds numerous maquiladoras. The Delphi and Sony manufacturing plants are the top two employers for all the maquiladoras in Nuevo Laredo. And for those of you of have an interest in the prehistory of cybernetics, consider that the old Laredo Army Air Field (now known as Laredo International Airport), was the site where the U.S. Army Air Force calibrated their computerized gunsights. Driving north along the Bullock Loop, I even noticed some windowless DC-9 aircraft. These are freight forward aircraft operated by Kalitta Air that fly directly to Willow Run, Michigan. Yet the ones I saw bore no markings, and in fact, bore a striking resemblance to the red-flashed Janet aircraft Trevor Paglen often writes about (see previous post on this very topic). 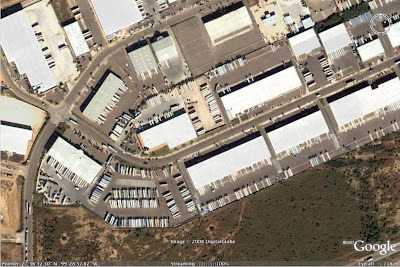 That Laredo International Airport is a site with bustling DHS aerial operations is no surprise, as it is one of the facilities used to ferry illegal aliens and other personae non grata to various locations throughout the hemisphere. A series of articles (and perhaps a book) needs to be written on different types of urban and infrastructural phenomena in Texas. Perhaps it will begin here.